High quality product. Well constructed and sturdy. I am very pleased with the binoculars. Not quite sure how to use the range finder, but I'll figure it out. The internal compass is a nice feature too!!! Nice item, Good value for a 10x50. Nice quality. Optics are good. No complaints on visual, Magnification is good. Has front lense caps attached which are a little difficult to put in place as they sit inside the lense diameter front. 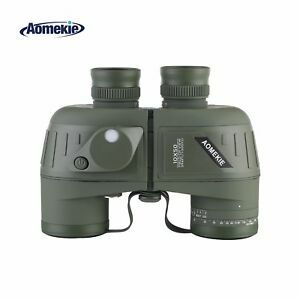 Fantastic product for the price - crisp optics, and great build quality - fantastic value. Not lightest but you wouldn't want them to be for what they are! Bought these for our boat. We can now clearly see landmarks and the compass will help get us get back to home no matter how long we are out. Outstanding quality. Good product, I can reccomend it.